For those of you from the New York City area know that the 4 Subway train will take you to beautiful Yankee Stadium. Growing up just outside of NYC Ive been a NY Yankee fan my entire life and the 4 train was how we got to the ballpark. This photo reminded me of takin’ the subway to the Bronx. OK, I digress. Ive seen photos of The Subway Station at Zion National Park and knew that I just had to photograph this. My buddy and I planned a 3.5 day whirlwind Southern Utah/Northern Arizona trip (more photos to come including Bryce NP, The Wave, Antelope Canyon, and Zion) so we could photograph The Subway. This is a magical place – almost too surreal to believe. Its also super slippery, dangerous, and an exhausting hike. I have to say that this was probably the most amazing hike Ive ever done. I spend a lot of my summer hiking around the Bay Area and Yosemite but this hike was just something else. It starts out on top of giant red-rock canyons before you descend to the floor of the Left Fork of the North River. From there you walk 4 miles up the Left Fork until you come to The Subway. Along the way you cross the river 30-40 times (trying not to get wet), pass by gorgeous waterfalls, autumn trees, and giant red-rock canyons. What an amazing place!!! We were the 3rd car to arrive and just as we arrived at the cascade falls (Archangel Falls) we ran into the other hikers. One of the photographers, Andy Cook (from Colorado) was super nice and we chatted with him for a while before he took off to beat us to The Subway. When we finally arrived at The Subway we met the other 5 hikers all of them for some reason were shooting from the bottom of The Subway Thats when we informed them that they needed to go up into it to take the classic shot We thought it was amusing that we told some professional photographers how to shoot The Subway Oh, and since we booked it back we were the first car to depart! Luckily for us there were only 6 or 7 of us in total (we heard the previous day there were 35 photographers trying to cram in). One guy must have arrived much earlier in the afternoon/morning cuz he took off almost as soon as we got there. Another couple took their photos pretty quickly and then left. That just left my buddy and myself and Andy Cook and his friend. We took turns taking photos and each got our shots. My buddy and I then left Andy and his friend to have the entire area to themselves. Although it took us 4 hours to hike in, we hauled ( and made it back to the car in 2 hours Just enough time to get back to try to photograph The Watchman for sunset. For anyone wanting to do the hike, you can read on — otherwise I advise you to stop reading now I strongly recommend you get canyoneering boots for this hike — they will keep your feet dry and seem to suction themselves to the rock and lessen the chance that you’ll slip. 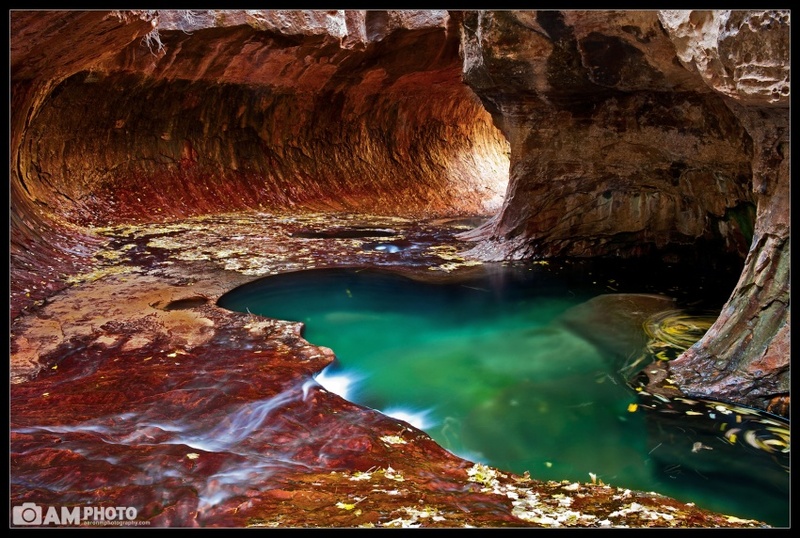 To get to The Subway first you have to apply for a permit via the Zion National Park website. We got our permit a week before we were arriving since it was the down-season (in the busy season you can get it 3 months prior to your trip). You drive out of the park, into the town of Virgin, and then back into the park via Kolob Terrace Rd before parking at the Left Fork parking lot. You then travel about a half mile before descending down an extremely steep 400 ft plunge from the top of the red-rocked canyons to the river floor. When you get to the bottom you need to make note of the surroundings because its easy to miss the trail up to the parking lot on your way back. Theres a couple exit signs marking the trail up but be careful because you may be on the other side of the river bank on your way back and may never see the signs. After 9 miles you don’t want to miss the exit! Why would you be on the other side of the river bank you ask? Well, because theres no trail to The Subway and back — you’re literally making your own way upstream. I think we crossed the stream 30-40 times each way. Although there’s no real trail to The Subway there is a defined ”path” for most of the hike. I put ”path” in quotes because it’s just stretches of land where people have walked before and pushed some of the reeds and sand down. For most of the way to The Subway we could find the path and figure out when/where to cross. I would say about 60% of the hike is on the ”path” while the remaining 40% is split between sand, walking in the river (the last bit), climbing over boulders, and crossing the stream. The Left Fork was also pretty low and we were able to cross on top of rocks without getting our feet wet. This is not an easy hike — numerous times we had to climb up boulders, climb down rocks, and pick our way upstream. Im glad that I had some rock-climbing skills just so I didn’t turn an ankle (note you don’t need to be a rock-climber to do this, but it helped when we were going over rocks to have a better idea where to place my feet/hands). I used a walking stick for the hike to The Subway but quickly realized on the way back that it was slowing me down and got rid of it. When you get about of a mile away from The Subway you come to these gorgeous cascade waterfalls. From here you have to walk on the side of the river (in the river, although it was so low that our feet stayed dry), up to The Crack. Theres a couple fake cracks that are obviously not The Crack — when you get to The Crack you’ll know it. Its impossible to miss because practically the entire river flows through it. You then walk a bit further and arrive at The Wave. When you get there make sure to go up into the subway and shoot down-stream (for the more popular shot). You can also get some shots going up the stream but those aren’t as exciting. Theres a lot of neat little pools of water that are about 2-3 feet deep that you can photograph as well. I carried a GPS tracker that my friend made and exported the path as a KML file. Unfortunately it lost signal a couple times and the path is all screwed up. You can get the gist though. On the way back make sure to stop at the Dinosaur Tracks (don’t touch the rock or it’ll disintegrate). The 400ft climb up back to the top of the canyon and our car was a PAIN but we were so pumped that we just busted up it in about 10 minutes. What an amazing hike!! !